Stegosaurus, Tyrannosaurus Rex, Pterodactyl, Diplodocus and Amargasaurus!! 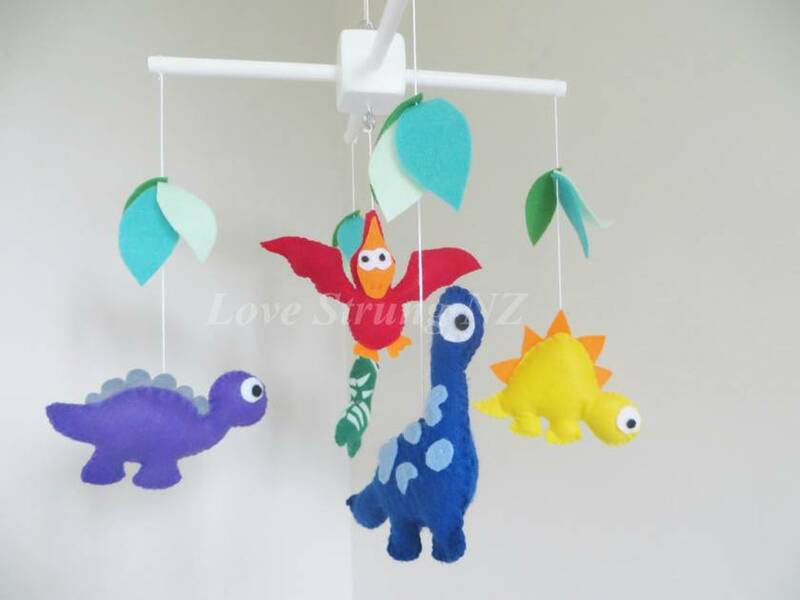 This amazing dinosaur mobile is carefully handcut, stitched, stuffed and strung by me. Each of the five dinosaurs is made from a lovely colourful felt and gently stuffed with polyfil to create a 3D dino. 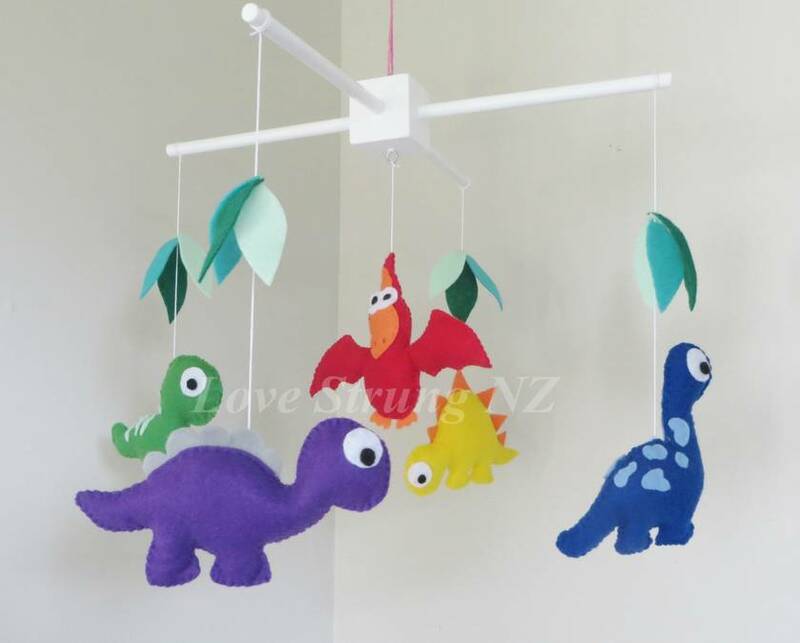 Being 100% handcut and stitched, no two dinosaurs are every exactly the same meaning you get a unique mobile made just for you. 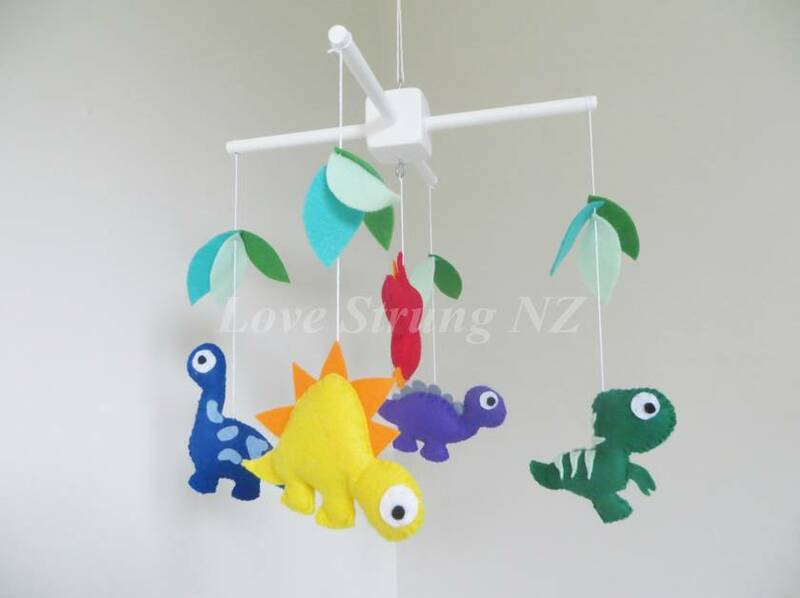 The multishaded green leaves attached above the dinosaurs are moveable along the string and can be separated or bunched together depending on your preference. The dinosaurs are strung with thick cotton and tied to a custom made white hanger. These hangers are hand cut and painted with a semi gloss to add a gentle shine. The dinosaurs are all evenly weighted meaning the mobile will gently bob up and down when touched. They also move and turn with a gentle breeze. This is both soothing and entertaining for wee ones. 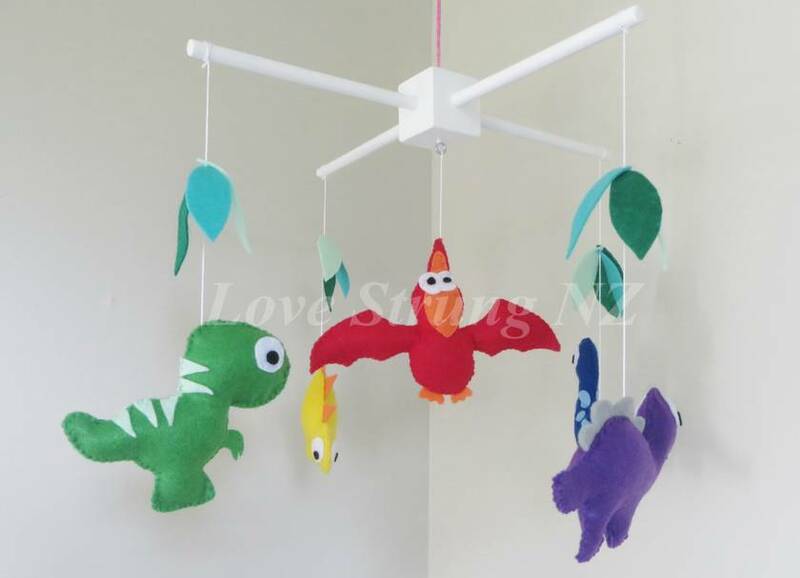 This gorgeous mobile can be a wonderful addition to your bub's nursery, a lovely unique gift for someone expecting or for a dinosaur lovers room big or small. A rotating music box can also be added to your order making the mobile more interactive, again please contact me for availability and prices. Pterodactyl - (red and orange) - 16cm wide x 10cm high. The hanger is 28cm by 28cm square. The four outside dinosaurs drop approximately 25cm from the hanger and the middle dinosaur 15cm. This can easily be adjusted should it be required. Please let me know what colours you would like upon purchase. If you do not inform me of colour choice the default (colours pictured) will be made. If you are looking for a very particular colour i.e. aqua blue rather than just blue please contact me to check availability before purchase. All mobiles are made to order meaning no two are ever exactly the same. I am also happy to customise a perfect mobile exactly the way you want it, please contact me to discuss your requirements .